Take in the views from a terrace and a garden and make use of amenities such as complimentary wireless Internet access. Additional amenities at this hotel include wedding services and a fireplace in the lobby. At The Port William, enjoy a satisfying meal at the restaurant. Quench your thirst with your favorite drink at the bar/lounge. A complimentary full breakfast is served daily from 8:30 AM to 9:30 AM. At King Arthur's Arms Inn, enjoy a satisfying meal at the restaurant. Need to unwind? Take a break with a tasty beverage at one of the 2 bars/lounges. A complimentary English breakfast is served daily from 9 AM to 10:30 AM. At Atlantic View Hotel, enjoy a satisfying meal at the restaurant. Wrap up your day with a drink at the bar/lounge. A complimentary full breakfast is included. Tintagel is a beautiful village on the north coast of Cornwall, in the South West of England. Due to its stunning scenery and wealth of historic attractions, Tintagel is one of the most visited villages in Cornwall. As such, Tintagel hotels offer as good a base as any from which to explore the local area. The village and its castle have a long association with the legends of King Arthur and his Knights of the Round SEOSITE_LEVEL_DESCRIPTION. Some accounts describe Tintagel as the place of Arthur's conception and after gazing up at its magnificent 13th-century ramparts, you will not find it hard to see the castle's mythical qualities. Tintagel Castle sits perched atop an island in a scenic bay looking out to the Atlantic. The main part of the castle is reachable by a footbridge that crosses over a deep ravine and makes for an exciting walk. For those who would like a bit more of a hike, there is also the King Arthur Walk, which forms part of the South West Coast Path around Tintagel. The area was immortalised by Lord Tennyson in his poem, ‘Idyll of the Kings', and it is no less romantic today. Located just below the castle is Merlin's Cave, where it is said the wizard once lived. The caves are accessible by a footpath, but be careful at high tide as they fill up with sea water. This part of Cornwall is renowned for its natural beauty but Tintagel is perhaps overly spoilt in this regard. The coastline around the village is dotted with valleys, caves and beaches, perfect for exploring whatever the weather. Rocky Valley is one such magical place, with steep cliffs leading down to a winding river and crashing waves. A little further along the coast is Trebarwith Strand Beach, a wide and windswept sandy beach that is an ideal swimmer's spot. After a day of sea swimming and mythical adventure, you're sure to be feeling hungry. Luckily Tintagel has some great restaurants offering the best in local cuisine. The Village Tea Rooms serves up the tastiest cream tea you'll ever try in an incredibly charming environment. Charlie's Café has a great selection of British classics, including top-quality steak, as well as loads of vegetarian options. For top-notch fish and chips, The Big Fish in the middle of town is the place to go. 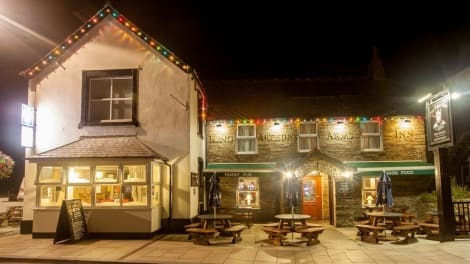 After a fish supper, head to The Cornishman Inn for an authentic pint replete with local shanties. Another popular pub is found just down the road at King Arthur's Arms Inn.